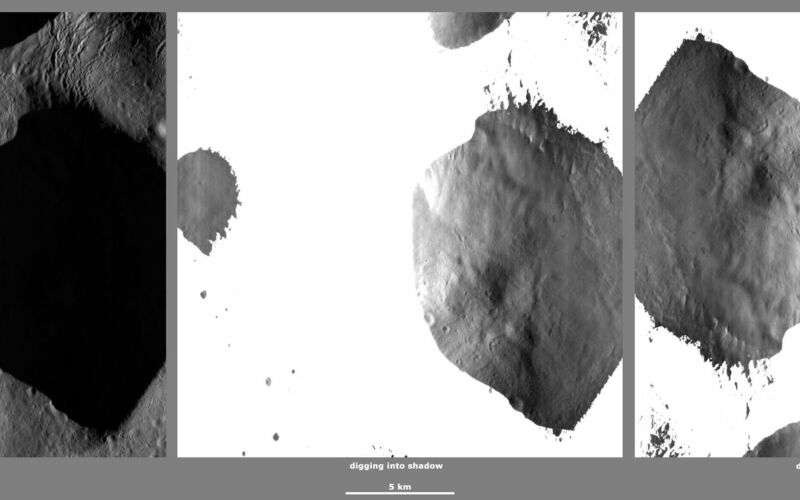 These Dawn framing camera (FC) images of Vesta demonstrate a special analytical technique, which results in shadowed areas of Vesta's surface becoming illuminated. These shadowed areas are usually in the interiors of craters. In this technique reflected light from crater walls, which are lit by the sun, is used to peer into the shadowed areas, which are not lit by the sun. The reflected light that scatters into the shadows is very faint. But, the superb dynamic range of the framing camera detector results in the enhancement of this weak signal. Thus, the surface in the shadowed areas is illuminated by reflected light from the surrounding topography. 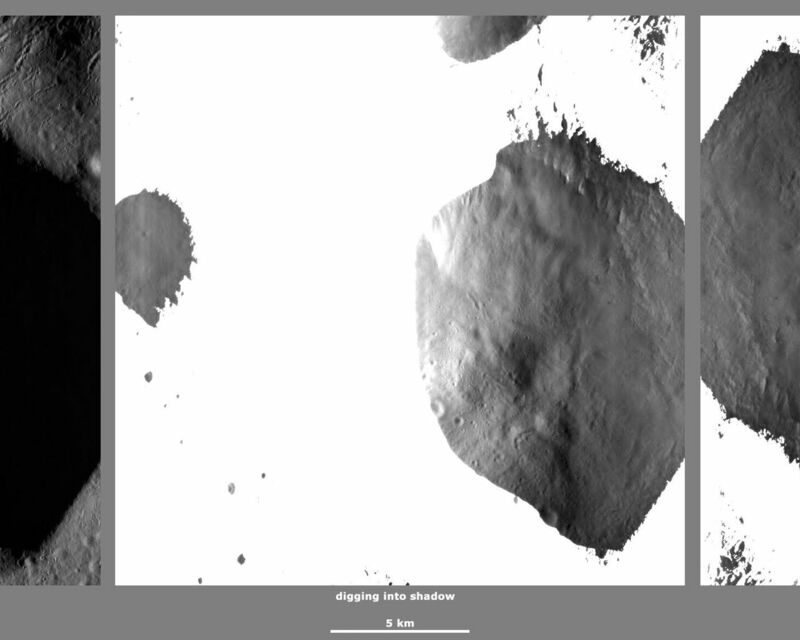 The left image shows the crater with a shadowed interior and the center image shows the illuminated shadowed interior. Interestingly, the light reflected into the shadowed area has a different geometry, which results in concave features like craters looking more like convex blisters. The illuminated image is rotated by 180 degrees in order to adjust for this effect. In the illuminated, rotated image small craters and streak features resulting from slumping can be seen. 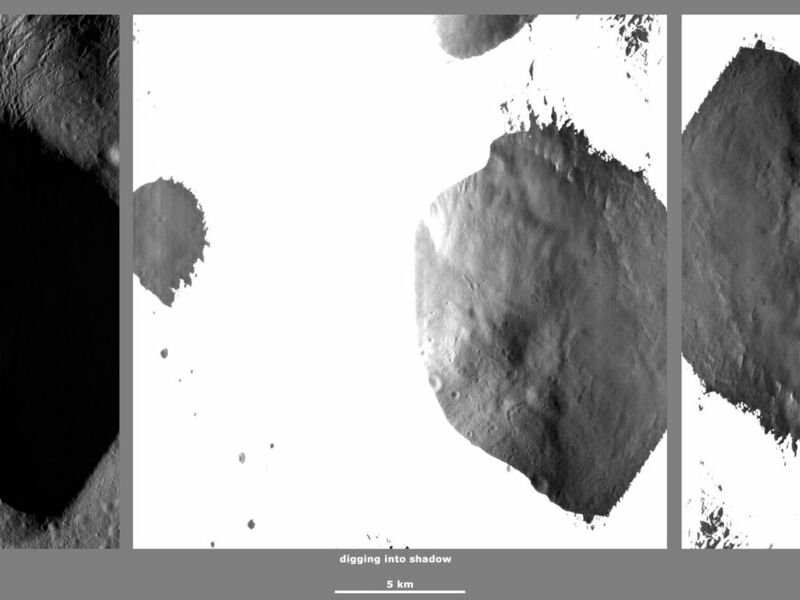 In these images multiple shadowed areas in different craters have been illuminated. The original image is located in Vesta's Floronia quadrangle, in Vesta's northern hemisphere. NASA's Dawn spacecraft obtained this image with its framing camera on April 26, 2012. This image was taken through the camera's clear filter. The distance to the surface of Vesta is 272 kilometers (169 miles) and the image has a resolution of about 20 meters (66 feet) per pixel. This image was acquired during the LAMO (low-altitude mapping orbit) phase of the mission.